Keeping control in a classroom is difficult, and when students misbehave or disrupt class, teachers and administrators need tools to respond. For generations, one of the tools of discipline in schools has been suspension: temporarily removing a misbehaving student from school. Of course, suspensions aren't the only option. Ed100 Lesson 5.13 explores the broad topic of discipline in school, including alternatives to suspension. There is a growing consensus among educators that suspensions and expulsions do harm. Removing young people from the active learning environment may turn those students toward permanent school failure without making schools safer or more effective. Responding to these findings, schools in California are gradually reducing the use of suspension in school discipline, especially for "willful defiance". The state of California is supporting this trend by using the California School Dashboard to shine light on the issue. 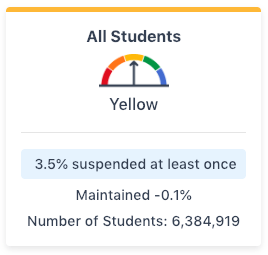 Statewide, about 3.5% of the 6.4 million public school students in grades K-12 were suspended at least once during the 2017-18 school year — over 220,000 students. It's common for students to be suspended more than once; in 2017-18 the total number of suspensions in the state was 363,000, about two-thirds higher than the number of individuals suspended. The California School Dashboard focuses attention on number of individual students rather than the number of suspensions. Suspension rates vary significantly. For example, the average suspension rate for socioeconomically disadvantaged students in 2017-18 was 4.4%, more than double the rate for students not disadvantaged (2.0%). Foster youth were suspended at a high rate (15.2%), as were homeless students (5.6%). Suspension rates tend to be higher in rural areas. They also tend to vary quite a bit by race/ethnicity, as described below. As with all indicators on the dashboard, the cut-points above aren't the end of the story because performance color is designed to reflect evidence of change. Where suspension rates are improving more than 0.3% year-on-year, the dashboard may assign a sunnier performance color. The reverse is also true. In the table below, the middle column is the same as the cut-points above. The columns to the right reflect an improving trend; those to the left reflect a worsening trend. When the Dashboard is being applied to a small school (or a small subgroup) of fewer than 150 students, the outer columns are combined with the inner ones. By eliminating the nuance of by how much, this methodology avoids chopping up the data into groups too small to be displayed. 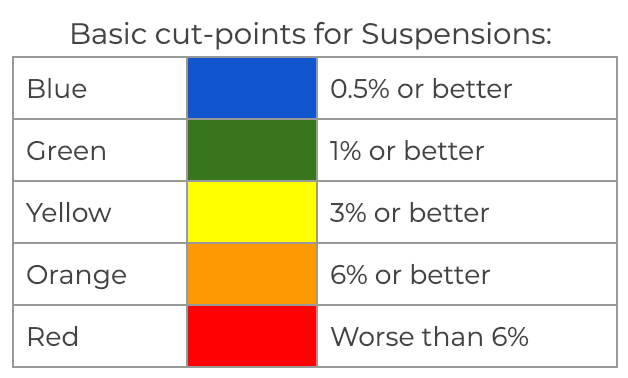 In this "three-by-five methodology" the dashboard shows whether suspension rates got worse, stayed the same, or got better. As always, the big idea behind the Dashboard is to focus attention where it is needed so that local leaders can use the data to improve. How does your school compare? The Dashboard includes a feature called a "placement report," which lists schools or subgroups in the 5x5 grid above. This can be a helpful starting place for leaders of districts, counties and PTAs to begin a conversation. Identify schools around you that are improving, and perhaps you can learn from them. To find the placement report, look in the upper right corner of the Dashboard for the link to "additional reports." Using Dashboard data, EdSource has created a concise search-and-compare tool to make comparisons easier. This post is the seventh in a series about the California School Dashboard, the state's main tool for monitoring progress in the improvement of schools. If you don't understand the basics about the Dashboard — especially how it blends "status" and "change" — you might want to read this blog series from the start. The dashboard may be a better tool than AYP because it shows progress or decline in various categories. Student attendance and motivation to learn really matter too.